These Hangtag Hanger Adapters adapt any hang tag to hang lower for better visibility! These adapters are perfect for larger rearview mirrors and they print in black on white card stock. These Heavy Brite service dispatch numbers are the largest, thickest, brightest number on the market. They are printed in black ink on one side and available in bright yellow, blue, red, green, orange, and white stock. This Heavy Duty Plastic Coated Disposable Paper Floor Mat has a unique ribbed design and is rigid to provide extra strength and durability. This mat has great anti-slip properties and texture to help insure the car floor stays clean. Great for use by professional auto detailers. Daily Time and Job Tickets - also commonly referred to as job time tickets, mechanics time sheets, flag sheets or stub sheets for auto dealers. This job time tickets is used mostly in import car dealerships. No need to lick & stick, these time tickets are pressure sensitive to stick without moisture. Which means no more time tickets falling off hard copies and getting lost. This Key Drop Envelope is 24 lb. kraft envelopes that will secure customer keys and help identify them. The envelopes print in Black ink, open at the top and are available in two different designs with repairs listed and comments section and expanded comments section and no repairs listed. These Latex Disposable Gloves are great for janitorial and general cleaning. They are available both with powder and powder free. 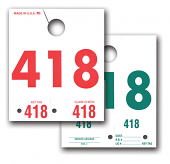 These Service Dispatch Tags are durable and easier to read because they hang lower from the mirror. This makes them easier for your staff to see and read. They print red on front and green on back. The technician can then switch them to green indicating the vehicle repair is completed and ready for pick-up by the customer. These Multi-Option Night Drop Envelopes are designed for states that require dealers to offer customer options on repair estimates. They are made of heavy duty 24 lb white wove stock. These envelopes are the perfect size and large enough to securely hold keys with remote and compact enough to fit thru doors and not overload your box. They print in Blue ink and are available in 1 color imprint in quantities of 500 and up. 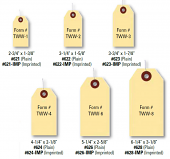 This Service Estimate and Parts Return Night Drop Envelope is made of heavy duty 24# white wove stock. These envelopes are the perfect size. They're large enough to hold keys with remote and compact enough to fit through doors and not overload your box. 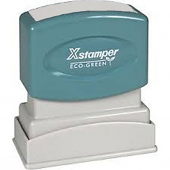 These office stamps are highly visible & self-inking. Oil Change Stickers - in-stock and ready to ship: These are the clear (non-adhesive) oil change stickers used by quick lube shops and dealerships nationwide. These Paper Floor Mats are printed on premium heavy duty 50 pound paper. This is the tough, heavy duty paper mat used by most auto dealers, body shops and repair shops. It offers excellent protection for the plush interior of today's cars. These large 17" x 22" paper floor mats cover almost 400 square inches and come two designs - footprint and plain white. 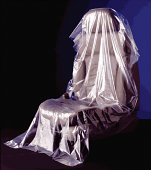 Clear Plastic Seat Covers - Slip-N-Grip: Your customers deserve the best. Protect your customer's interior with genuine brand name Slip-N-Grip plastic seat covers. The Original Round-Corned Plastic Automotive Key Tag: This genuine Versa-Tag plastic Poly Auto Key Tag is made of strong 23 mm polyethylene with rounded corners. These key tags are easy to write on. These Poly-Back Floor Mats are extremely high wet strength. Both designs are a big 17" x 22" mat for good coverage. These are the highest quality mats available. Show your customers that you are grateful and care about their business. These mats come in two designs - customer satisfaction and footprint. These Black Nitrile Mechanic Gloves are great disposable automotive gloves. They are powder free. We carry high quality AMMEX GlovePlus brand gloves. These ribbons are made to be used with Estampe's Oil Change Sticker Printing System. Our system uses the Zebra® TLP2824 printer which is an extremely popular industry standard thermal transfer printer. 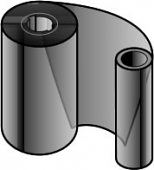 This means our ribbons can also be used with a wide variety of other machine printed oil change sticker systems. For example, they're 100 % compatible with the Reynolds and Reynolds® and Colonial® systems. 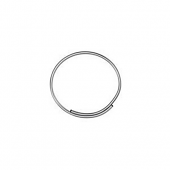 They are also compatible with the Zebra 800132-102 thermal transfer ribbon.